It was a big day at Bowdoin Park for a trio of Pennsylvania runners, who each qualified for Nike Cross Nationals out of NXR-Northeast. North Allegheny's Zach Kinne, Loyalsock Township's Isabel Sagar, and West Chester Henderson's Jenna Mulhern each earned individual qualifying spots for NXN by finishing in the top five for non-team qualifiers. Kinne took second in the Boys' Championship race. The NA senior and Illinois transfer battled well with eventual winner Ryan Oosting of Massachusetts. Kinne finished in 16:06 for runner-up honors. He'll return to Portland after qualifying with his Neuqua Valley (IL) team two years ago in 2016. On the girls' side, a pair of tickets to Portland were punched. Sagar, a senior and Harvard recruit, went 18:53 for sixth overall in the regional field. Next week, the 1A state champ close out her final prep season with an appearance in NXN. Mulhern, a freshman, will finish out her dream ninth grade season with a trip out west. The AAA state champ ran 18:56 for seventh. Sagar and Mulhern earned the fourth and fifth spots for individuals. 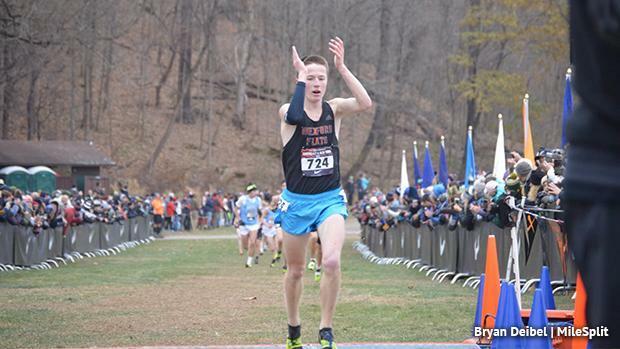 It wasn't to be for any PA teams, which will likely not send any full squads to NXN next week. The top two teams in the Championship races qualify automatically for Nike Cross Nationals. In the boys' race, the top PA team was Downingtown West. Third at states in AAA, the Whippets ran well at Bowdoin managing just a 25 1 through 5 gap. Isaac Valderrabano led the way for D-West with a 45th place finish. North Allegheny, led by Kinne's second place finish, took ninth. NA's Dan McGoey took 19th overall to close out his junior season. Seneca Valley was 14th overall. Though entered, the LaSalle College boys did not compete. The North Allegheny (128 points) girls ran well to take third in the team standings behind champions North Hunterdon (NJ) and second place Champlain Valley (VT). NA, the AAA state champs, were just 11 points off Champlain. The Tigers had a pair of strong finishes from Hannah Lindgren (11th in 19:11) and Keeley Misutka (13th in 19:22). West Chester Henderson, behind Mulhern's national-qualifying performance, were fourth with 193 points There is still a chance, however, for a wildcard bid for the Tigers and Warriors, though the selection committee has rarely taken wildcard for the Northeast region.